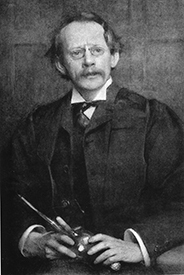 J. J. Thomson was awarded the Nobel Prize in Physics in 1906 "in recognition of the great merits of his theoretical and experimental investigations on the conduction of electricity by gases." He was affiliated with University of Cambridge his entire career, first getting his education there and later holding positions such as Lecturer, Master of Trinity College, and Cavendish Professor of Experimental Physics. He is credited with discovering the electron, but his work covered a wide variety of areas like electricity and gases, magnetism, light, and properties of matter. December 18, 1856Birth, Manchester (England). 1880Obtained BA degree in Mathematics, Trinity College, University of Cambridge, Cambridge (England). 1880 – 1918Fellow; Lecturer; Master, Trinity College; and Cavendish Professor of Experimental Physics, University of Cambridge, Cambridge (England). 1883Obtained MA degree in Mathematics, Trinity College, University of Cambridge, Cambridge (England). 1894Awarded the Royal Medal, Royal Society. 1902Awarded the Hodgkins Medal, Smithsonian Institute. 1902Awarded the Hughes Medal, Royal Society. 1906Awarded the Nobel Prize in Physics "in recognition of the great merits of his theoretical and experimental investigations on the conduction of electricity by gases". 1914Awarded the Copley Medal, Royal Society. 1923Awarded the Franklin Medal and the Scott Medal, Franklin Institute. 1931Awarded the Dalton Medal, Manchester Literary and Philosophical Society. 1938Awarded the Faraday Medal, Institute of Civil Engineers. August 30, 1940Death, Cambridge (England). Son and advised by J. J. Thomson at Cavendish Laboratory, University of Cambridge. Advised by Thomson under Wiltshire Prize and Hutchinson Research Studentship. Advised by Thomson at University of Cambridge. Aston served as Thomson's assistant and both employed at Cavendish Laboratory. Advised by Thomson at University of Cambridge. Collaborated on textbook "Properties of Matter." Advised by Thomson at Cavendish Laboratory, University of Cambridge. Advisor at Owens College, University of Manchester. Research advised by Thomson at University of Cambridge, B.A. thesis: "The Velocity of the Ions produced in Gases by Röntgen Rays." Both employed at Cavendish Laboratory. Cavendish Professor of Experimental Physics. Fellow and President. Awarded the Royal Medal (1894), the Hughes Medal (1902), and the Copley Medal (1914). Received B.A. degree in Mathematics (1880) and M.A. degree in Physics (1883). Fellow; Lecturer; and Master. Cavendish Professor of Experimental Physics, Cavendish Laboratory. Awarded the Franklin Medal and the Scott Medal (1923). Awarded the Faraday Medal (1938). Awarded the Dalton Medal (1931). Awarded the Hodgkins Medal (1902). Archive recording of J.J. Thomson, [videorecording]/ 1934. Atomic physics [sound recording] : sound track of the film / produced by J. Arthur Rank for the Atomic Energy Commission, 1948. J. J. Thomson handwritten volume of A TREATISE ON THE MOTION OF VORTEX RINGS, 1882. J. J. Thomson letters to Ernest Rutherford, 1895-1935. J. J. Thomson papers, 1884-1934. J. J. Thomson's seventieth birthday tribute, 1936. Exeter EX4 4PT, England UK. Nuclear history [sound recording]: voices of the past; compiled by Glenn Seaborg. Sir J. J. Thomson papers and correspondence, 1836-1956. Century of the atom [sound recording]: ...told through the voices of the scientists who created the nuclear age / a presentation of the U.S. Atomic Energy Commission ; narrated by Chet Huntley and Glenn T. Seaborg. Daniel F. Comstock autobiography, 1963. Ernest Rutherford correspondence [microform], 1906-1937. Harold A. Wilson autobiographical notes, 1962. Harold W. Webb autobiography, circa 1962. Items in various series of The Royal Society, 1882-1899. Items in various series of The Royal Society, 1887-1923. Items in various series of The Royal Society, 1891-1921. John Henry Michell papers, 1884-1890. Johns Hopkins University Department of Physics records, 1887-1988 (bulk 1949-1969). Josiah W. Gibbs papers, 1811-1947. Louise S. McDowell papers, 1894-1955. Oral history interview with Allen Goodrich Shenstone 1979 March 20. Oral history interview with Harold A. Wilson, 1964 March 3. Oral history interview with Margrethe Norlund Bohr, 1963 January 23 and 30. Oral history interview with Sir George Paget Thomson, 1963 June 20. Oral history interview with Sir John Cockcroft, 1963 May 2. Reminiscences of A. B. Wood [sound recording], 1960. Richard Threlfall correspondence with Sir J. J. Thomson, 1886-1896. Sir Thomas Havelock papers, 1894-1968. Sir William Lawrence Bragg papers. William Duane correspondence with K. T. Compton, Marie and Pierre Curie, Max Planck, Ernest Rutherford, and J. J. Thomson, 1905-1933. A text-book of physics / by J.H. Poynting ... and J.J. Thomson ... Properties of matter. A text-book of physics / by J.H. Poynting ... and J.J. Thomson ... Sound. A text-book of physics / by J.H. Poynting and Sir J.J. Thomson. A text-book of physics : By J.H. Poynting and J.J. Thomson. Heat /with 193 illustrations. A treatise on the motion of vortex rings. A university textbook of physics : volume I, Properties of matter / by J.H. Poynting and J.J. Thomson ; rev. by G.W. Todd. Applications of dynamics to physics and chemistry / by J. J. Thomson. Au dela de l'électron / par Sir J.J. Thomson ; traduit de l'anglais par R. Frie ; préface de M.A. Cotton. Beyond the electron / by Sir J. J. Thomson. Die Entladung der Elektricität Durch Gase / von J.J. Thomson ; Aus dem Englischen übersetzt von Paul Ewers ; Ergänzt und mit einem vorwort versehen von Hermann Ebert. Electricity and matter / by J.J. Thomson. Elektrizitat und materie / Von dr. J.J. Thomson ... Autorisierte übersetzung von G. Siebert. Elektrizitäts-Durchgang in Gasen /by J.J. Thomson ; Deutsche autorisierte ausgabe unter mitwirkung des autors besorgt und ergänzt von Dr. Erich Marx ... mit 187 figuren im text. Elements of the mathematical theory of electricity and magnetism / by J.J. Thomson. Notes on recent researches in electricity and magnetism, intended as a sequel to Professor Clerk-Maxwell's Treatise on electricity and magnetism; by J.J. Thomson. On some applications of dynamical principles to physical phenomena : [part 1]/ by J. J. Thomson. On some applications of dynamical principles to physical phenomena : part II/ by J. J. Thomson. Rays of positive electricity and their application to chemical analyses. Röntgen rays : memoirs by Röntgen, Stokes, and J.J. Thomson /tr. and ed. by George F. Barker. Tendencies of recent investigations in the field of physics / by Sir J. J. Thomson. The atomic theory /by Sir J.J. Thomson ... ; delivered in the Sheldonian theatre, June 10, 1914. The discharge of electricity through gases; lectures delivered on the occasion of the sesquicentennial celebration of Princeton University. By J.J. Thomson. The electron in chemistry : being five lectures delivered at the Franklin Institute, Philadelphia / by Sir J.J. Thomson. A history of the electron : J.J. and G.P. Thomson /Jaume Navarro, Ikerbasque research professor, Universidad del País Vasco/Euskal Herriko Unibertsitatea. Flash of the cathode rays : a history of J.J. Thomson's electron / Per D. Dahl. Histories of the electron : the birth of microphysics /edited by Jed Z. Buchwald and Andrew Warwick. J. J. Thomson discoverer of the electron. J. J. Thomson Nobel Prize biography. J.J. Thomson and the Cavendish Laboratory in his day. J.J. Thomson and the discovery of the electron /E.A. Davis and I.J. Falconer. The life of Sir J.J. Thomson, O.M., sometime master of Trinity college, Cambridge, by Lord Rayleigh.